Dayle Kountz from Bozeman, Montana bought several bulls. 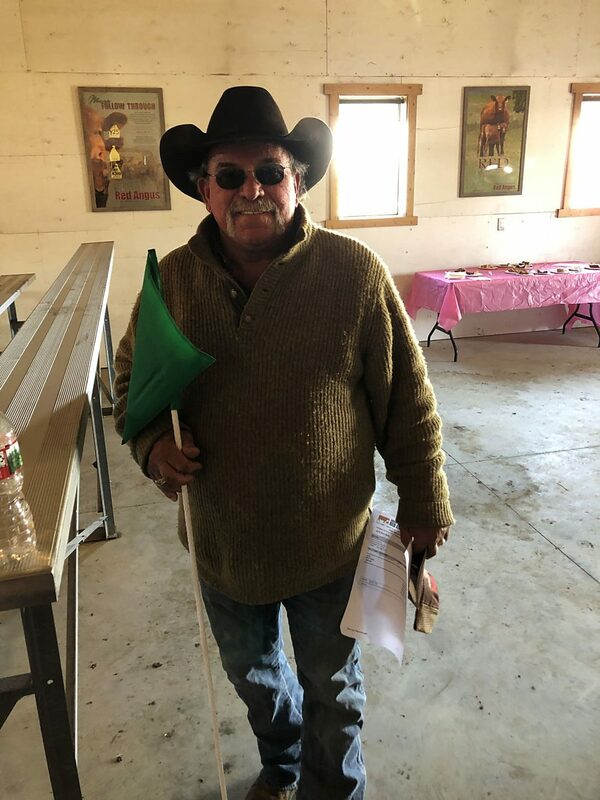 Green Mountain Red Angus celebrated their 20th Annual bull sale March 19, 2019 by offering a powerful set of well balanced bulls to the buyers in the seats of the sale facility located on the ranch near Logan, Montana. Congratulations on a great sale! Lot 1 at $36,000, GMRA GAME CHANGER 8270F, DOB 1/27/18, REG#3941443, H2R PROFITBUILDER B403 x GMRA PRIDSTOM 069, sold to ABS Global, DeForest, Wisconsin. Lot 10 at $19,000, GMRA BENEVOLENT 8242F, DOB 1/19/18, REG#3941619, FEDDES BRUNSWICK D202 x GMRA LARKABA 527, sold to 3K Land & Cattle, Justin, Texas & C&C Family Partners, Silsbee, Texas. Lot 2 at $10,000, GMRA HERDSMAN 8231F, DOB 1/17/18, REG#3941713, GMRA TESLA 6214 x GMRA VENICE 640, sold to Anthony Ranches Inc., Ryan, Oklahoma. Lot 5 at $9,500, GMRA CONNERY 8205F, DOB 1/9/18, REG#3941561, HXC DECLARATION 5504C x GMRA NEXA 455, sold to Bybee Cattle Company, Hamer, Idaho. Lot 11 at $8,500, GMRA COOL HAND LUKE 8238F, DOB 1/18/18, REG#3941683, HXC DECLARATION 5504C x GMRA OPHELIA 612, sold to Bybee Cattle Company, Hamer, Idaho. Lot 8 at $8,500, GMRA PROFESSIONAL 8227F, DOB 1/16/18, REG#3941521, H2R PROFITBUILDER B403 x GMRA MESA MAID 393, sold to Bar Open A Red Angus, Hamer, Idaho.